We’d love your help. Let us know what’s wrong with this preview of Battle Magic by Tamora Pierce. NEW YORK TIMES bestselling author Tamora Pierce returns to the magical world of Winding Circle. While visiting the God-King and the First Circle temple in Gyongxe, mages Briar, Rosethorn, and Evvy are invited to visit the emperor's summer palace. Although treated like royalty when they first arrive, the mages soon discover that the emperor plans to invade Gyongxe, posing a NEW YORK TIMES bestselling author Tamora Pierce returns to the magical world of Winding Circle. While visiting the God-King and the First Circle temple in Gyongxe, mages Briar, Rosethorn, and Evvy are invited to visit the emperor's summer palace. Although treated like royalty when they first arrive, the mages soon discover that the emperor plans to invade Gyongxe, posing a fatal threat to the home temple of the Living Circle religion. Accompanied by one of the emperor's prize captives, the three mages rush to Gyongxe to warn its citizens of the impending attack. With the imperials hot on their trail, Briar, Rosethorn, and Evvy must quickly help the country prepare for battle. To ask other readers questions about Battle Magic, please sign up. is this the last book? i skipped the 'melting stone' because of the negative reviews. i hope this will be better. and i also hope ms pierce will write a final battle with the emperor and/or the empress because there's a hint at the ending of book 1 about it. anyway i was hoping book 2 is still about the 4 friends....quite disappointed it's not. Shantel Tuggle The "Circle of Magic" books are a series of two quartets and a set of three (not technically a trilogy, as there's no word if Pierce will continue…moreThe "Circle of Magic" books are a series of two quartets and a set of three (not technically a trilogy, as there's no word if Pierce will continue this series). The first quartet is "The Circle of Magic" and its books are, in order, "Sandry's Book", "Tris's Book", "Daja's Book" and "Briar's Book". The second quartet is "The Circle Opens". Its books, also in order, are "Magic Steps" (which centers on Sandry), "Street Magic" (centers on Briar), "Cold Fire" (centers on Daja), and "Shatterglass" (centers on Tris). This series takes place four years after the first and marks the students becoming teachers in their own right, with their own trials as they come to terms with new obligations. The third series, called "The Circle Reforged", includes the books "Battle Magic" which takes place almost two years after "The Circle Opens", "Melting Stones", and "The Will of the Empress". "Melting Stones" and "The Will of the Empress" take place at roughly the same time, set four years after "The Circle Opens". "Melting Stones" concentrates on Briar's Student, Evvy, and his teacher, Rosethorn, though he isn't a main character in the book and is only mentioned in passing. "Battle Magic" was the last book written, but comes before both "Melting Stones" and "The Will of the Empress" (which was actually written almost directly after "Shatterglass" was finished). As to books that include all four of the young mages, those include the entire "Circle of Magic" quartet and "The Will of the Empress". See more reviews on my blog. Maybe I should have rated this one three or three and a half stars, I don’t know. I’ve been waiting eight years for this book. Eight years. I’ve had a lot of time to build up anticipation and expectations and preemptive FEELZ, so it’s a little hard for me to separate out what’s just a personal disappointment and what’s a subjective problem and what’s “not a problem at all, what’s wrong with you, Whitley?” Which is not to say the book was bad, just…compared to her othe See more reviews on my blog. Maybe I should have rated this one three or three and a half stars, I don’t know. I’ve been waiting eight years for this book. Eight years. I’ve had a lot of time to build up anticipation and expectations and preemptive FEELZ, so it’s a little hard for me to separate out what’s just a personal disappointment and what’s a subjective problem and what’s “not a problem at all, what’s wrong with you, Whitley?” Which is not to say the book was bad, just…compared to her other works, I don’t think it’s as strong as it could have been. This book had most of the hallmarks that make Tamora so great. The magic in this is wonderfully inventive, and there’s a ton of cool visuals in this novel. Stuff that made me stop reading for a minute because it was just that cool and I wanted to picture it for a while. The settings are vivid and varied; as they travel from one place to another, it really feels like different places and not just “Europe with funny clothes.” The writing is practically invisible. It does what it needs to but doesn’t pull you out of the story, which I absolutely love. Not enough people appreciate the value of invisible narration, and I always prefer it over the prettiest phrases out there. Personal preference, I know, but still. I also felt like the characters were lacking. Peirce’s strength has always been in her character relationships, in the way that characters interact and the way that interaction shows their personalities. In this book, however, characters spend more time doing stuff alone and in silence than they do with each other. I felt very distant from the characters, and I didn’t get to know the new characters at all. Which is such a shame, because Briar is my favoritest of her Emelan characters, and I was so looking forward to him, but what I got was more like a Briar puppet. The POV switching was out of control in this novel, too. Usually we get a chapter or at least a scene dedicated to one POV before switching, but this book would hop back and forth from paragraph to paragraph in some cases. It almost pains me to give this book one star because I love Tamora Pierce and Winding Circle so much. But honestly this book really disappointed me. I think one of the major issues was that she had already hinted at so many plot points from her other books, which limited the direction of the story flow. We knew that they would be in a war, we knew that Evvy would meet Luvo, we knew they would be forced to do things that would give them horrible nightmares. These plot points were basically the e It almost pains me to give this book one star because I love Tamora Pierce and Winding Circle so much. But honestly this book really disappointed me. I think one of the major issues was that she had already hinted at so many plot points from her other books, which limited the direction of the story flow. We knew that they would be in a war, we knew that Evvy would meet Luvo, we knew they would be forced to do things that would give them horrible nightmares. These plot points were basically the entirety of the story, and we already knew them coming into the story. It made the book predictable and not very... real. Like she's following an outline of a story rather than letting the characters and situation develops as it pleases. Another major problem was the battle scenes. This book relied heavily on actions and war scenes, focusing on the darker side of life. But Tamora Pierce just doesn't write this sort of genre and it shows. The battles come across as very watered-down and almost childish. She attempts to make dark and gritty scenes where killing people is equivalent to murder in the real world, but the scenes read more like fantasy battles where deaths are not as important as the fantasy. But then her characters mourn their loss of innocence as if it really mattered and then it just didn't feel believable because the war scenes didn't translate to that darkness she was aiming to convey. In the same light, there just wasn't enough exposure to the villain. They spend a couple days with the emperor, he burns the rose bushes and keeps couple of prisoners and suddenly he is evil incarnate. Uh... no. That's really not convincing enough for me to see that he is evil. It's so white and black, it really is like a children's book - which makes the realistic deaths even more unbelievable. And Evvy and Briar saving one prisoner. Is it realistic that there is only one prisoner? They want to do good, to save their friends because it is the right thing to do, but they only save the one person because they know him. That is such children's book logic. Ughhh that's the major problem with this book. It attempts to be an older book, what with dark scenes of torture and murder and revenge, but has unmistakable traits of a children's book. And it fails at being either. The scenes with Rosethorn just didn't work for me either. She didn't read well as a character because she seemed so world-weary as an adult. I just didn't believe her character when the plot was focusing solely on her. And sometimes it slipped into first person.... Uh strange. And then that quest? RIDICULOUS. It felt fake, unnatural, just another random task that she had to do. Actually, most of the book's plot felt like that - like the characters were just going though the motions. The only redeeming thing was seeing the characters interact with each other. Because I love Briar and Rosethorn and Evvy, those scenes were fun to read. But.... Even those weren't up to par, to be honest. The characters didn't change, they never revealed anything different than what we knew of them beforehand. And that is a problem when a character doesn't change in a book at all. They were like stereotypes of their own character. Evvy was always hoarding food, Briar was always subtly trying to care for Rosethorn, and Rosethorn was always tweaking someone's ear. Cool. But I've seen it all before. I wanted more or something different. What's more is that none of the side characters even made an impression on me. In all of Pierce's other books, you do end up loving the secondary characters - but here, they might as well be cardboard cutouts. And was it just me, or did Pierce suddenly turn into an overly descriptive writer? I've never had a problem with this before from her writing, but she really piled on this descriptions of clothing and buildings. Descriptions that did next to nothing for giving greater understanding of characters or scenes. It was too much. The ending was a cop out. Literally deus ex machina with the gods. This was just a weak book from Tamora Pierce overall. I am so disappointed because I thought The Will of the Empress was absolutely amazingly well done. This felt more like Melting Stones. Unpolished and more than a little boring. One star because I didn't think this book was written well. Too many problems with unnecessary plot, unrealistic battles and emotions, uncertainty if this is a children's or adult book, weak character development, etc. I would still read it because I love this world and the characters. But to be honest, if this was the first book I read of Winding Circle.... I would not even pick up the other books. Recommended only for fans of the previous books. I was appalled for the longest time, not knowing what story I'd missed as they went on about Yanjing, while I had no idea what they were talking about. I though, Surely, I would remember them going through a war?! I looked online, but could not seem to find one of her books I'd yet to read. It pleases me greatly that I could not find it because it has yet to be written, and that it will be soon, but it also vexes me that it comes AFTER "The Will of the Empress" and "Melting Stones". I suppose t I was appalled for the longest time, not knowing what story I'd missed as they went on about Yanjing, while I had no idea what they were talking about. I though, Surely, I would remember them going through a war?! I looked online, but could not seem to find one of her books I'd yet to read. It pleases me greatly that I could not find it because it has yet to be written, and that it will be soon, but it also vexes me that it comes AFTER "The Will of the Empress" and "Melting Stones". I suppose that does a wonderful job of building suspense, but really, suspense aside, I would have enjoyed it anyway and wish she'd already written it. All the Tamora Pierce fans have been waiting to find out what exactly happened to Briar, Rosethorn, and Evvy during their trip to Gyongxe. Now we finally do! This book is told in the above three character's point of view. This story has been hyped up a great deal. Now, does it live up to it all? To be honest, I'm not sure about that. Don't get me wrong, I enjoyed reading this book. Briar is my favorite character in the Circle universe and he doesn't disappoint in this book either. He's still runn All the Tamora Pierce fans have been waiting to find out what exactly happened to Briar, Rosethorn, and Evvy during their trip to Gyongxe. Now we finally do! This book is told in the above three character's point of view. This story has been hyped up a great deal. Now, does it live up to it all? To be honest, I'm not sure about that. Still, something didn't seem right. Perhaps I have been waiting for so long (EIGHT YEARS!) that the book can't possibly live up to my imagination. Whatever the reason, I didn't feel very satisfied. First, there was the inconsistencies with what has been described in Will of the Empress. In Battle Magic, there was never any indication of the combat moves Briar have learned from Yanjing warriors nor when he learned to make his "mind palace" (or "mind Cottage Discipline"). Either Pierce forgot these details or she didn't think they needed elaboration. I can forego the first part but Briar seemed to imply that his "mind palace" was what kept him sane during his time as a prisoner (view spoiler)[which was apparently retconned to being less than a day (hide spoiler)] which would hardly be something you gloss over. Second, I struggle to believe that the things that the characters saw would give them PTSD. I can understand Evvy (view spoiler)[ since she lost her cats (which were her biggest emotional support) and she was tortured. Feet whipping is a lot more painful than it sounds, after all. (hide spoiler)] But Briar and Rosethorn have had harsh childhoods so they wouldn't be strangers to suffering and have very pragmatic personalities. For these two to get PTSD, I would think they would have to go through something even worse (view spoiler)[ than seeing a few destroyed villages and participating in a few battles (where they mainly destroyed equipment). Terrible? Yes. Traumatizing? No. (hide spoiler)]. In Will of the Empress, Briar hinted that he did many horrifying things that he was not proud of. In my opinion, he did hardly did anything more harsh than what he did during Street Magic. Overall, I did enjoy the book but I was also very disappointed. I can see that this book was challenging to write because a lot of the details have been mentioned in Will of the Empress. When we know what's going to happen, readers can only be hooked by the "why" and the feelings that come from the writing. However, I didn't feel anything from the battles. I didn't feel the horror or sadness or anything really. Unfortunately, the more Tamora Pierce writes books in the Circle of Magic world, the more they become simple, "No one understands how powerful ambient magic is and we can never be defeated, so let's just write an entire novel describing the ways this power can defeat other mages." At the expense of truly developing any side characters - one of the key reasons Pierce's previous books are so enjoyable - they get thrown in almost as props while Rosethorn, Briar, and Evy do cool stuff. And they CAN Unfortunately, the more Tamora Pierce writes books in the Circle of Magic world, the more they become simple, "No one understands how powerful ambient magic is and we can never be defeated, so let's just write an entire novel describing the ways this power can defeat other mages." At the expense of truly developing any side characters - one of the key reasons Pierce's previous books are so enjoyable - they get thrown in almost as props while Rosethorn, Briar, and Evy do cool stuff. And they CAN do cool stuff. This book is cover-to-cover action, and the reader gets exposed to quite a bit of shamanic magic and the strange gods of new countries. However, there's SO much and so little development and depth to all this action that it actually became confusing. It was difficult to keep track of why this person was winning or why that person was winning, but at no point did I actually fear they WOULDN'T win because of this overwhelming sense of, "We're just so powerful, we don't really have to worry." It's always nice to be back with these characters - some of my favorite in the series - but I no longer really cared whether they made it out. Pierce's writing has become almost shallow, the opening sequence nothing but a description of, "Two people are sitting here, and this is what they look like, and, oh, somehow we're best friends with the king of the country?" No further detail was provided about that. I was left confused about why the characters were here and even why they were so invested in this country. I was also unconvinced by some major plot points: that the integrity of an entire world depended on four little objects never previously mentioned in the series, that three mages were necessary to warn an entire country war was coming (something they'd already been worried about for a long time - they figured it out but no spies or other mages did? ), and then, with the final climax, with how easily the characters escaped this seemingly inescapable predicament. In previous books, Briar's teachers always gave him and the girls lectures on becoming too prideful in their power, in just depending on their magic to save them. Piece now depends on the pure force of "ambient magic is cool" to save her novel, and it doesn't work. I love Tamora Pierce for her world building, but she now hurries through that just to get to long, action-filled passages that are uninteresting because that base world-building is lacking. Also, considering how many things Evvy has been through, her dialogue is FAR too babyish, especially compared with the way she spoke when we met her. I'll always love Tamora Piece, but this is definitely not her finest work. Suddenly lines and circles moved and rose. Briar stood on a hillside. He looked down to find himself in armor, wearing the bead necklace, holding a bead in his hand. He looked out over the stony ridge before him, seeing the thinnest trail of smoke rise from behind it. "Tell the men ready." The order seemed to come from his own throat. "Ready!" cried a soldier at his side. Together the men at his command set their weapons: bundles of tubes shaped like arrows bound together at the end. Long fuses trailed from the end of each tube and were twined together to form one big fuse. With his finger Briar traced the image of one line until it met a dot and an enclosing circle on the wooden bead. He put forth a little magic, raising the picture of all three into the air above his necklace. Steering the line with his finger, he shifted it until it pointed straight at that thin column of smoke. He nodded at the man beside him. The soldiers touched flame to the single long fuse on their weapons. It burned swiftly through the twist. The moment each of the smaller fuses fell free, on fire, Briar said, "Loose." The man next to him shouted, "Loose!" The soldiers on the catapult let their strange weapons fly. They soared high into the air, trailing smoke and the mingled scents of sulfur and boom dust. The ground shook. Earth, trees, and rock spouted high into the air where the weapons must have struck. while i love Briar and Evy, i wish this wasnt set in the past because i want to see how everyone else is doing. i already know what happened to them in Yanjing traumatized them but i dont have an urge to find out. i am much more interested in what happens after the will of the empress....ill still read this one though and then ill read melting stones. So freaking excited for this book. I have been dying to find out what happened to Briar and Rosethorn since TWOE. You can't even know. THANK YOU MILA OF THE GRAIN! TP can't get this one out fast enough. Further adventures of Briar, Evvy and Rosethorn, traveling through lands with different magical traditions. One of those lands (evil emperor alert! boohiss) decides to conquer a neighboring land, and our heroes decide to intervene. The rest of the Circle gang doesn't make an appearance in this installation in the series. I didn't care for the fact that the evil Yanjing empire felt very ancient Chinese to me, while the Gyongxin nation felt like historic India-in-the-Himalayas, or maybe Nepal or M Further adventures of Briar, Evvy and Rosethorn, traveling through lands with different magical traditions. One of those lands (evil emperor alert! boohiss) decides to conquer a neighboring land, and our heroes decide to intervene. The rest of the Circle gang doesn't make an appearance in this installation in the series. I didn't care for the fact that the evil Yanjing empire felt very ancient Chinese to me, while the Gyongxin nation felt like historic India-in-the-Himalayas, or maybe Nepal or Mongolia, with a child Dalai Lama. I can't handwave evil fantasy empires that too closely reflect Asian cultures, like I did when I was a teenager. Also: be a little more creative. This book has its moments, but I'd recommend it only for people who've really loved the rest of the series. Two and a half stars. 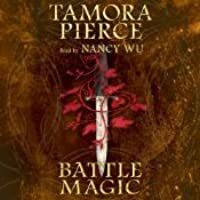 Battle Magic by Tamora Pierce is the third book in the Circle Reforged series, but in the sequence of events in the series this action takes place between Briar's story in Street Magic and Evvy's story in Melting Stones. As hinted at in Will of the Empress, Briar, Rosethorn, and Evvy have fought in an epic battle on their travels through the world. Battle Magic tells the full story of their exploits. Disclaimer- I am a fangirl of this author and recommend her work to every child, teen, and adult Battle Magic by Tamora Pierce is the third book in the Circle Reforged series, but in the sequence of events in the series this action takes place between Briar's story in Street Magic and Evvy's story in Melting Stones. As hinted at in Will of the Empress, Briar, Rosethorn, and Evvy have fought in an epic battle on their travels through the world. Battle Magic tells the full story of their exploits. Disclaimer- I am a fangirl of this author and recommend her work to every child, teen, and adult that I can. While visiting the first Circle temple in Gyongxi, mages Briar, Rosethorn, and Evvy are invited to visit the emperor's summer palace and view the gardens. While they are initially treated like royalty, the mages soon discover that the emperor plans to invade Gyongxi and pose a fatal threat to the home temple of the Living Circle religion. Accompanied by one of the emperor's prize captives, the three mages rush to Gyongxi to warn its citizens of the impending attack. With imperial soldiers hot on their trail, Briar, Rosethorn, and Evvy must quickly help the country prepare for battle. But even with the help of new allies, will their combined forces be enough to fight the imperial army and win the war? If you have not read the other Circle books then you have no idea who any of these people are and should start reading with Sandry's Book (Circle of Magic, #1). If you do not want to start at the beginning, you can start here and enjoy the book, but it might take a while before you understand the interpersonal relationships and details of the world as a whole. I loved the detail of the characters and the growth each character faces. Rosethorn, Briar, and Evvy each face personal challenges and are just such rich and deep characters that I was sad to see the book end. Even the 'secondary' characters were fully fleshed out and felt complete to me. I love the fact that Pierce can mention or allude to romantic relationships and not have to describe anything. She puts the complicated matter of love, in all of its incarnations, out there in a matter of fact way that is a refreshing change to so many other books but does not include anything that I would shield my youngest readers from while not talking down to older readers and adults. Likewise, she does not shy from the harsh realities of war and power hungry people, but it is done in a straight forward and deceptively simple manner. I am already eagerly awaiting the fourth book in the Circle Reforged series which is still unnamed but is scheduled for release sometime in 2015. Tamora Pierce has been one of my favorite authors for a long time, ever since I was a little nine-year-old reading SANDRY'S BOOK on the way to Georgia. I haven't loved her most recent releases. The most recent book in the Emelan universe, MELTING STONES, was lacking in the plot department and felt detached, even for a side book. Each book in her Provost's Dog series was wonderful as a standalone, but failed to congeal as a trilogy. 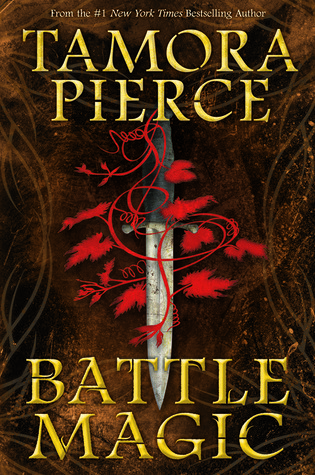 But man, BATTLE MAGIC reminded me why I've been a fan of Pierce Tamora Pierce has been one of my favorite authors for a long time, ever since I was a little nine-year-old reading SANDRY'S BOOK on the way to Georgia. I haven't loved her most recent releases. The most recent book in the Emelan universe, MELTING STONES, was lacking in the plot department and felt detached, even for a side book. Each book in her Provost's Dog series was wonderful as a standalone, but failed to congeal as a trilogy. But man, BATTLE MAGIC reminded me why I've been a fan of Pierce for more than a decade. BATTLE MAGIC fills in one of the gaps between the end of The Circle Opens quartet and THE WILL OF THE EMPRESS. Briar, his teacher Rosethorn, and his student Evvy are almost done traveling the world when the end up in the middle of a war. They must help defend Gyongxe (fantasy Tibet) against the Emperor (of fantasy China). It's a set up for much action and pain, but the war setting also allows for an exploration of each of their true characters. There are several new faces, many of them memorable. I can't be the only one who finishes BATTLE MAGIC and hopes that Parahan, a slave of the Emperor, shows up in future books. There's lots of fun magic, not just the academic and ambient types that Pierce has developed through the ten previous books in this setting. And the relationships are heart wrenching. They are far more than teacher-student pairs. Rosethorn, Briar, and Evvy are family - family far from home. I think BATTLE MAGIC is essential for Tamora Pierce fans. I also think that if you aren't a Pierce fan, you should be. This is a book full of fierce mages, tough women, and a noble cause. There are scenes that will break your heart and others that will make you cheer. It also caused me to reread most of Pierce's backlist, which I hadn't been planning on. Rosethorn is still weak from her death and magic-fueled resurrection, so she embarks upon a lifelong dream: a tour of the world's gardens. Her protege Briar comes along, both to see the gardens and to keep an eye on her health, and with Briar comes his new student Evvy. The book opens as they end their visit to Gyongxe, a sort of pseudo-Tibet (sky burials, led by a child chosen to rule because he literally has the wisdom&personalities of elders within him, mountainous, etc). They are invited Rosethorn is still weak from her death and magic-fueled resurrection, so she embarks upon a lifelong dream: a tour of the world's gardens. Her protege Briar comes along, both to see the gardens and to keep an eye on her health, and with Briar comes his new student Evvy. The book opens as they end their visit to Gyongxe, a sort of pseudo-Tibet (sky burials, led by a child chosen to rule because he literally has the wisdom&personalities of elders within him, mountainous, etc). They are invited to visit the much larger, more powerful empire in Yanjing (a magical China-analog) and see the emperor's famed gardens. Rosethorn leaps at the chance, but during their visit at the intensely formal imperial court they notice more and more disturbing clues that the emperor is planning war on Gyongxe. They leave the court in hopes of warning Gyongxe before the invasion begins. Rapidly, they are embroiled in all-out war. I wish Good Reads offered half-stars, because this was more of a 3 1/2 than a 4-star read for me. But my love of Pierce's books (and the world of the Circle of Magic, specifically) encouraged me to bump it to four instead of going with three. Let me start by saying I didn't want this book to be written. I've read all of Pierce's books in publishing order, which means I read both THE WILL OF THE EMPRESS and MELTING STONES prior to this one. And I really loved the mystery of Gyongxe and Yanjing tha I wish Good Reads offered half-stars, because this was more of a 3 1/2 than a 4-star read for me. But my love of Pierce's books (and the world of the Circle of Magic, specifically) encouraged me to bump it to four instead of going with three. Let me start by saying I didn't want this book to be written. I've read all of Pierce's books in publishing order, which means I read both THE WILL OF THE EMPRESS and MELTING STONES prior to this one. And I really loved the mystery of Gyongxe and Yanjing that hovered over me. I liked imagining things that were so wretched that they would leave all three characters with emotional scars. My imagination was both far worse and far better than what really happened to Evvy, Rosethorn and Briar. And that thing - the very thing I was dreading - is what made the book so powerful. Because here's the thing with imagining horrors: our brains can get ridiculously graphic in abstract ways, but the fact that I was imagining it meant that I could say "No, that couldn't happen to Briar." But now... in the world of the Circle of Magic, I know what things *did* happen, and my heart aches for all three of them. What I love is that Pierce showed us the horrors of war with simplicity. We didn't have to see women being raped by soldiers or repeated or disgustingly detailed scenes of torture to know that war is hell. No, we were given glimpses of people's suffering, and explored some of the very real long-term effects, and understood it deep in our bones. War is complex and futile and crushing. My favorite scene of all was probably the scene with the emperor's rose garden, where we were shown a force of very rational villainy. It wasn't a megalomaniac who was pure evil for the sake of being evil - it was a very lifelike emotion coming from a person with far too much power. It made the entire story much more real. I have loved Tamora Pierce's books since second grade. She has always been my favorite author and it kills me that I didn't like this book. Will of the Empress is my favorite of hers, hands down, and I was expecting Battle Magic to be along the same lines in quality. Instead, the book felt very empty. As usual, the action scenes are superbly written, but I feel as though the characters weren't as fleshed out as normal. The side characters felt very two-dimensional. In addition, a lot of what Bri I have loved Tamora Pierce's books since second grade. She has always been my favorite author and it kills me that I didn't like this book. Will of the Empress is my favorite of hers, hands down, and I was expecting Battle Magic to be along the same lines in quality. Instead, the book felt very empty. As usual, the action scenes are superbly written, but I feel as though the characters weren't as fleshed out as normal. The side characters felt very two-dimensional. In addition, a lot of what Briar said/hinted at in WotE was not included. FOLLOWING ARE SPOILERS FROM WILL OF THE EMPRESS: The biggest thing was creating the rooftop. The exact quote from WotE is "I was locked up for a while in Gyongxe. It was either go mad... or retreat inside of me. I did things I'm not proud of when I got out..." Never happens in Battle Magic. Some of the other things he mentions in passing as well are completely ignored. When I saw there was a Tamora Pierce book I hadn't read I started freaking out! When did it come out?!? How did I not know?!? Then I realized it still wasn't out yet:'( Why!?! Why did you have to bring my hopes up then shatter them?!? WWWHHHYYY?!? Anyways, I can't wait for the book to come out. I really want to know what happened in Yanjing and it has been really bothering me! What happened!!!!?????!!!!!!????? Highly disappointed. Oh no! I killed a few people and someone whippe When I saw there was a Tamora Pierce book I hadn't read I started freaking out! When did it come out?!? How did I not know?!? Then I realized it still wasn't out yet:'( Why!?! Why did you have to bring my hopes up then shatter them?!? WWWHHHYYY?!? For the first time, Tammy has messed with her own timeline. Battle Magic takes place 2 years before Melting Stones, but after the events of Street Magic. Here, Briar, Rosethorn, and Briar’s student Evvy are on a tour of Gyongxe, a nation that is nearest in the world to the heavens and, therefore, home to many different faiths. They are invited to visit neighboring Yanjing, specifically to see the famed imperial gardens. There, they see the emperor’s cruelty firsthand in dealing with a rosebush t For the first time, Tammy has messed with her own timeline. Battle Magic takes place 2 years before Melting Stones, but after the events of Street Magic. Here, Briar, Rosethorn, and Briar’s student Evvy are on a tour of Gyongxe, a nation that is nearest in the world to the heavens and, therefore, home to many different faiths. They are invited to visit neighboring Yanjing, specifically to see the famed imperial gardens. There, they see the emperor’s cruelty firsthand in dealing with a rosebush that had the bad fortune to succumb to mold and in a prince kept chained as a slave and the emperor’s pet. From here we get to experience the war that is mentioned in passing in both Melting Stones and later in The Will of the Empress in the form of Briar’s PTSD (or at least the way he deals with it after the fact). Make no mistake about it, this is war. It is bloody and cruel and entirely unrepentant. It’s the darkest Tammy has gone down the violence road (though the major conflict in Lady Knight comes close), and it’s certainly the most explicit of her books. She isn’t gratuitous about it, but she isn’t pulling any punches, either, which I appreciated. Because of this, though, it requires a slightly more mature audience. I don’t want to say older, necessarily, but it wouldn’t be a bad idea to make sure your child (if that’s who you’re shopping for) is prepared for the level of blood and guts that come with this story. True to form, the conflict in the story echoes some aspect of real world cultures/places/events, and this will seem to some very much an echo of China’s aggression toward Tibet, which is something also to be mindful of if you’re looking for similar subject matter or ways to tie this in with other interests. I’ve been critical of the latest books in this universe, and this installment is truer to Tammy’s fighting form: the characters are true, the action scenes superbly written, and the description spot on. I appreciated the return to third person narrative, though the shifting narrative between the three main characters was a new trick. I will note that some of Briar’s descriptions of the war in The Will of the Empress don’t quite add up anymore (which bothered me), and that my imagination created many things that were worse than we saw here, which I would have liked to have seen here. However, as Tammy said in the dedication: war is hell. Deadlines are hell, too, and we could hardly have an 800-page book about Gyongxe (right? Because if we could have, I would have been on board with that). All things considered, she did a pretty good job here. Definitely a solid addition to my bookshelf and the Emelan canon at large, though not her very best work. This review has been hidden because it contains spoilers. To view it, click here. Sadly, this was the first book of Tamora Pierce's books that I didn't really enjoy. I really regret saying this, as I've been a long time fan to Tamora Pierce, and I definitely can say that her books taught me a lot. But this time I felt that the book built too much on the 'cool magic powers that no one can understand' feel that started in the Will of the Empress. The spiritual magic especially felt out of place. It changed from powerful magic to gods and spirits that come alive with no explanat Sadly, this was the first book of Tamora Pierce's books that I didn't really enjoy. I really regret saying this, as I've been a long time fan to Tamora Pierce, and I definitely can say that her books taught me a lot. But this time I felt that the book built too much on the 'cool magic powers that no one can understand' feel that started in the Will of the Empress. The spiritual magic especially felt out of place. It changed from powerful magic to gods and spirits that come alive with no explanation, it just didn't feel like it didn't belong in the world of the Circle. I also didn't feel engaged with the plot and everything was so black and white, which I thought was a big step back for Tamora Pierce. I didn't connect with any of the side character, not like how I usually do, with Jak, Keth, and even the villains. Berenene was such an intriguing antagonist, and Weishu was not at all. Much like Pierce's other recent novels, Battle Magic suffered from poor, repetitive writing with frequent breaks in narration for lengthy descriptions, mostly of clothing. The story was repetitive, too - there's nothing that Briar and company hadn't done before. There's also nothing that wasn't summarized in about three sentences in The Will of the Empress. Battle Magic was an utterly unnecessary, spectacularly poor addition to the Emelan series. Oh my…well I was lucky enough to receive a ARC copy of Battle Magic and little did I know that this is the third book in the series. I read it anyway and it was confusing and that is the ONLY reason I gave it 4 stars! I normally love Tamora Pierce's work so while reading this book I was very uncharacteristically disappointed. 1. PLOT: I was excited about the plot, which was so built up during The Will of the Empress—will be shortened to tWoE for the rest of the review. While reading, I realized that none of the events which Briar described in tWoE came up, or at least very few of them. Pierce sort of ignored Briar here. Also, I will talk more about the "gods" specifically in my next category, but makin I normally love Tamora Pierce's work so while reading this book I was very uncharacteristically disappointed. Also, I will talk more about the "gods" specifically in my next category, but making it so that the protagonists of the novel forget novel events of the story, such as gods themselves and the main magic stuff, does nothing. It forces back all sense of development and makes the entire book virtually meaningless. A forgetful spell is just as much of a cop out as a dream ending. It also allowed Pierce to cheat and change the sense of the world that she created without going against the books that came later on the timeline. If gods were also the reason for the halt of the Yanjing Emperor and the overcoming of adversity, doesn't that negate, at least in part, the power of the humans in this world? 2. WORLD: What I used to love about the Circle Universe was the rules that Pierce had laid out for magic. I loved that gods weren't popping up every which way, granting magic to some, or changing the fates of others. I love that there was an unknown aspect to the reason that magic existed, and that it was more attune to the nature of the person rather than anything divine. The gods that were introduced in Battle Magic completely destroyed that idea. It also gives the unfortunate addition of divine magic, and what it means for the universe at this point. I wish that more time was spent on fulfilling both Briar's and Evvy's accounts of the events in Yanjing rather than the extension on Rosethorn's story. Don't get me wrong, I love Rosethorn, but her storyline added to the unnecessary divine aspects of the world. Also, Rosethorn is almost so sacred that I wish that she still had more mystery to her. Evvy's accounts were fulfilled mostly, I believe, as I think Pierce did reread Melting Stones before writing Battle Magic. I can't say the same for Briar's accounts though, and I honestly don't think she reread The Will of the Empress, as there are many inconsistencies. ENDNOTE: I really really so wish that Pierce had stuck to the original ideas for the Circle Universe instead of adding divine powers. If she added them earlier, it would have been far less crazy, but adding them in so far into the series isn't a good thing to do. update.. welp it took awhile after the psm took hold of me .. to forgive this book for not being tris book. but i loved it the one thing im sad about is that the interaction between the girls and evvy dont really happen. id love to see how they take her. she is one of two students as i see part of the "circle" .. id love a super book where they start combining powers... not the way the kids did when they were young but the way sandy can basically weave anything .. oddly enough she kinda "fits".. also the little girl that tris picked up id love more on her and how the girls interact with her. i feel like it's a missed opportunity. because evvy powers are so weird even for a rock mage i feel like the girls, the boy, lark and rosethorn .. would be the few people would would understand. over all this book is solid. it gives you insight .. the "connect" moment is very late in the book which is sad for a tamora pierce book since she normally is really good at that connect with characters . she was just juggling a lot in the book. she came close to not pulling it off. It was a disappointment especially when compared to the previous books (which I had to reread to reassure myself that i did, in fact, like the series). Battle Magic was summarized in about one paragraph in Will of the Empress. Honestly it's not worth the effort of reading. This is still not my favorite of the Circle books--due mainly to the oddity of going back in time after WotE, I think, but partially to the sudden turn for the divine; I'm still not used to Emelan's mythology playing such a huge roll in the books--but man, I love Briar and Evvy and Rosethorn. 3.5 stars but rounded up. Not my fav Tamora Pierce book, but still good. This is a sort of odd admixture of pleasantly ambling found family adventure and The Horrors Of War. I liked the found family dynamics, and some of the early battle scenes were effective, but once the scope expands beyond small border squabbles to whole armies on the move, the focus on broad-scale logistics overwhelmed the emotional power of earlier encounters. Still, I was all set to give it three stars--and then the ending happened. Some books earn their literal deus ex machinas; this one didn This is a sort of odd admixture of pleasantly ambling found family adventure and The Horrors Of War. I liked the found family dynamics, and some of the early battle scenes were effective, but once the scope expands beyond small border squabbles to whole armies on the move, the focus on broad-scale logistics overwhelmed the emotional power of earlier encounters. Still, I was all set to give it three stars--and then the ending happened. Some books earn their literal deus ex machinas; this one didn't. It came out of nowhere, undermining (IMO) any attempt at character growth that had gone before. I was fairly disappointed by this book. I really enjoyed the beginning and the story in Yanjing -- the characters shine, the descriptions are great, and the plot is interesting. But once the story returns to Gyongxe, the plot and writing go seriously downhill. First of all, the characters become relatively flat. I expected to see a lot of growth from the characters in this novel since in Will of the Empress Briar is obviously heavily weighed on by this war, but Briar and the others seem to just t I was fairly disappointed by this book. I really enjoyed the beginning and the story in Yanjing -- the characters shine, the descriptions are great, and the plot is interesting. But once the story returns to Gyongxe, the plot and writing go seriously downhill. First of all, the characters become relatively flat. I expected to see a lot of growth from the characters in this novel since in Will of the Empress Briar is obviously heavily weighed on by this war, but Briar and the others seem to just take a lot of the not-very-intense violence in its stride and all of their talk about the "horrors of war" feels very rote and unlike them. The battle scenes all feel disjointed and distant, like you're reading a general's report of the action rather than with the characters in the midst of it. In all of the other Emelan books, the magic feels very real and well-defined, but in these battle scenes it's all over the place, especially in the final battle. Evvy is only able to destroy some catapult stones (unnecessarily, since Rosethorn destroys the catapults themselves), which is small compared to feats she performs earlier. In a previous battle Rosethorn kills mages by strangling them with their cotton necklaces and Briar kills them by engulfing them in trees sprung from their beads, but in the final battle Briar just destroys the beads without killing the mages. Why? There are glimmers of Pierce's usual wonderful writing even in Gyongxe, like when Evvy is being tortured and when Rosethorn is given the First Circle quest. But Evvy ends up alternating between being way too cheerful about her feet being healed and being childishly angry at the emperor, and those mood swings are completely unlike Evvy. Rosethorn's quest looks promising and like it'll impact her character, but she seems to come back the same person and no further mention is made of the Living Circle treasures. Also, talk about Deux Ex Machina -- there were hints throughout the book that the gods in Gyongxe would have a part to play, but the ending felt really rushed and incomplete. I kept expecting other characters to step up and fill in the gaps, but Parahan is never as interesting in Gyongxe and he was in Yanjing, and his sister Souda does not live up to her fiery, intriguing reputation. Also, it frustrated me that Briar kept thinking about how attractive Souda was while also thinking of her in a sisterly way. In Will of the Empress Briar is a complete womanizer and we see brief glints of that here, but in a forced, "you know he becomes a womanizer so let me drop hints here" way rather than in a natural character growth way. Third book of the Circle Reforged series, but first book in the Circle Reforged series chronologically in the story.